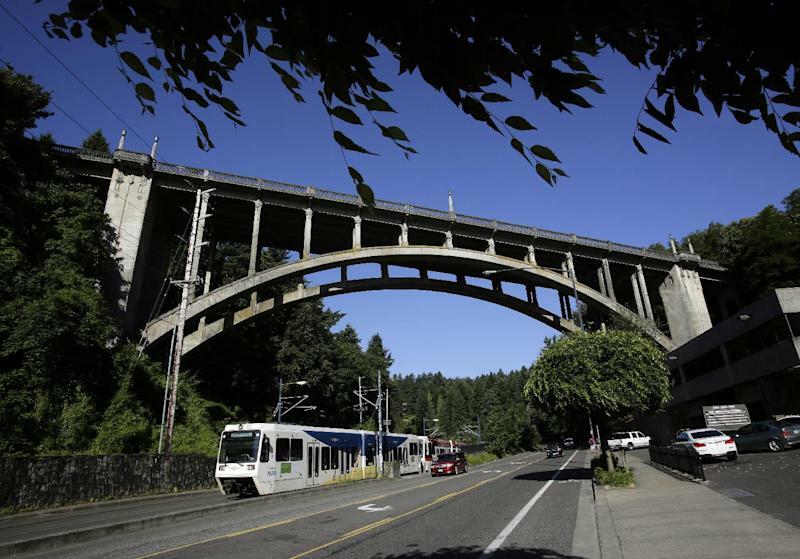 PORTLAND, Ore. (AP) — On a sunny January afternoon, 12 stories above a busy street, a newly engaged 19-year-old woman jumped to her death from a spectacular arch bridge west of downtown Portland. Last month, in the middle of the night, a 40-year-old man did the same. Last week, yet another person — a 15-year-old girl — plunged from the span. 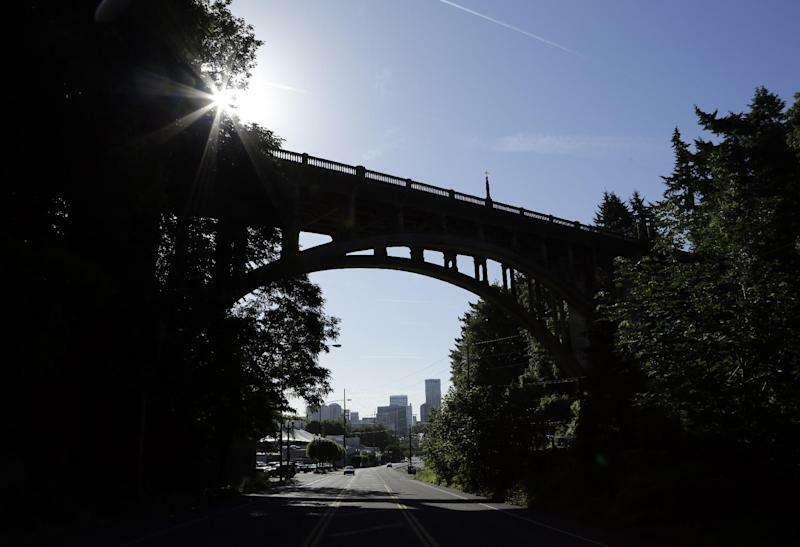 The deaths sadden but no longer surprise those who live and work near the Vista Bridge, known colloquially citywide as "The Suicide Bridge." They have come to expect such tragedies at the structure, from which there is a majestic vista of the city skyline; the opening shot of the TV series "Portlandia" was shot from the span. Attorney Kenneth Kahn shares an office with his wife, a life coach, that sits almost directly underneath the bridge. Over the years he has heard the horrible slam of bodies on pavement and discovered the remains of eight strangers. "Just imagine a human being detonating," he said. Now the Kahns are leading a group, Friends of The Vista Bridge, that is pressing the city to install suicide-prevention barriers, a step taken at bridges throughout the world, from the Cold Spring Canyon Bridge in Santa Barbara, Calif., to the Bloor Street Viaduct in Toronto and El Viaducto de Segovia in Madrid. Jumping from a bridge is an impulsive act. A barrier, the group contends, introduces a pause that may make someone think twice. But the group, which formed after the January suicide, faces its own obstacle: money. City leaders, though receptive to the idea, are tackling a $20 million budget shortfall, and it is projected to cost $2.5 million to put architecturally appropriate barriers on the bridge, which is listed in the National Register of Historic Places. The city may seek a federal grant. "We certainly think of it as a high priority," City Commissioner Steve Novick said. "But there's a whole mess of competing priorities and not much money." The group must also overcome the skepticism of those who believe that people who are determined to kill themselves will find a way. There is no shortage of spans in this city known as "Bridgetown," and within recent weeks people have jumped to their deaths from the eighth floor of a homeless shelter and the rooftop bar of a downtown hotel. "I don't particularly feel that throwing money at an issue necessarily solves it, and altering the bridge because of a few people who want to end their life seems pointless," said Les Anderson, a magician who is among several who've voiced their opposition on the group's Facebook page. "You're not going to stop someone who wants to end their own life." At least 17 people have killed themselves at the Vista Bridge in the past decade, although there is no reliable estimate for how many people have committed suicide there since it opened in 1926. Signs placed on the bridge last September promote a suicide-prevention hotline. Three callers have specifically referenced the sign when phoning for help, said David Westbrook of the nonprofit Lines for Life. Several studies have found a reduction or elimination in suicides from bridges with barriers. For example, the number of suicides off the Duke Ellington Bridge in Washington, D.C., went from an average of four a year before a fence was installed in 1986 to one in the five years following, with no corresponding increase at another nearby span. And a 2010 study found that suicides ceased at Toronto's Bloor Street Viaduct after construction of a $5.5 million barrier there, although the city's overall rate of suicide by jumping didn't change. Barrier supporters also cite a 1978 study by psychologist Richard Seiden of the University of California, Berkeley, who found that less than 10 percent of the more than 500 people who were stopped from jumping off the Golden Gate Bridge between 1937 and 1971 eventually killed themselves. However, Garrett Glasgow, a political science professor at UC Santa Barbara, noted that the Golden Gate jumpers were stopped not by a barrier but by human intervention, which he calls a "more effective suicide-prevention technique." There is no suicide barrier at the famous San Francisco landmark, from which more than 1,500 people have killed themselves. Officials have approved a design for a $50 million net that would catch people who try jumping, but construction has not begun because officials are still hunting for funding. In a paper published in the Journal of Social Science and Medicine, Glasgow examined the relationship between suicide and bridges across more than 3,000 counties in the U.S. While jumping as a method of suicide increased in those places, he found that counties with unprotected bridges did not have higher overall suicide rates than counties without such bridges. Glasgow added that no study has shown a statistically significant drop in the regional suicide rate even when a barrier is in place. In Oregon, 709 people killed themselves last year, mostly by shooting, hanging or poisoning themselves, so a barrier on the Vista is unlikely to make much of a dent in the overall state suicide rate. Eric Caine, director of the Injury Control Research Center for Suicide Prevention at the University of Rochester, said communities must decide whether the cost of such prevention methods is worth the payoff. "When a community has an iconic suicide site, and they know it, what do their values say about preventing suicide at that site, even if it's a small number overall?" he said. Another consideration is the public nature of the Vista Bridge deaths, which happen on a heavily traveled street, affecting scores of people. The teenager who killed herself last week landed on some light-rail tracks under the bridge, shutting down train service in both directions for more than an hour as police investigated. Commuters became unwitting witnesses. "There's a reason we have flesh," Kenneth Kahn said. "We're not supposed to see this stuff." Kahn's wife, Bonnie, saw the aftermath of 19-year-old Aris Bishop's jump in January. She remains convinced it was a terrible, spur-of-the-moment decision, and that Bishop would be alive today if there had been a barrier. "She had just painted her fingernails," she recalled. Some days later, Bishop's fiance unexpectedly visited the Kahns' office. Agitated, he paced back and forth, wanting to know precisely where she had died. The Kahns showed him. The young man walked to the spot and sat. Then he rose and sprinted down the street.